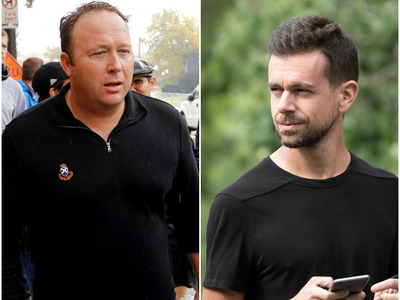 Reuters/Getty/Business InsiderAlex Jones and Twitter CEO Jack Dorsey. Jack Dorsey on Tuesday defended Twitter‘s decision to allow Alex Jones to keep tweeting after Apple, Facebook, and YouTube all barred the Infowars presenter. Dorsey’s decision has not gone down well with some, however, with Reddit’s former CEO suggesting it could lead to Twitter’s demise. Twitter CEO Jack Dorsey has tweetstormed his reasons for not banishing the conspiracy theorist Alex Jones from his service, and in doing so he took a not-so-subtle swipe at Facebook and YouTube. In a thread of five tweets, Dorsey on Tuesday said Jones had not broken Twitter’s rules and so the company decided against blocking him even after Apple, Facebook, and YouTube all barred the Infowars host on Monday. In a ticktock on Monday’s events, CNN’s Dylan Byers revealed that Facebook CEO Mark Zuckerberg personally stepped in to remove four of Jones’ pages. He did this only after learning of Apple’s decision, Byers said, explaining why Facebook announced its decision at 3 a.m. PT. YouTube and Spotify reacted similarly. Dorsey then went on to say that it was the job of reporters to shoot down any false assertions made by Jones. “Accounts like Jones’ can often sensationalize issues and spread unsubstantiated rumours, so it’s critical journalists document, validate, and refute such information directly so people can form their own opinions,” Dorsey said. As BuzzFeed’s Charlie Warzel pointed out, Jones does use Twitter differently from the way he uses other social-media sites, posting less inflammatory content. “He’s much more careful with what he posts,” Warzel said. But this hasn’t shielded Twitter from criticism following its decision to allow Jones a platform.